The Epson EH-TW810 is an accommodating 3D home cinema projector that shares much in common with its sibling flagship, the Epson EH-TW9100. Priced at £2,250, it significantly undercuts all three main rivals, the Sony VPL-HW50ES, Panasonic PT-AT6000E and JVC DLA-X35, without dropping any key features. It appears every inch the big screen bargain. Design wise this model's a peach. The bodywork is curvaceous and sports a fashionable matte white finish. A centrally mounted lens and forward facing heat vents keep things comfortable if you're opting for a coffee table mount. Connectivity is good, with two HDMIs, composite and component video, PC VGA and a 12v trigger to control an electric screen. All are hidden away behind a neat interface cover. Setup is straightforward. 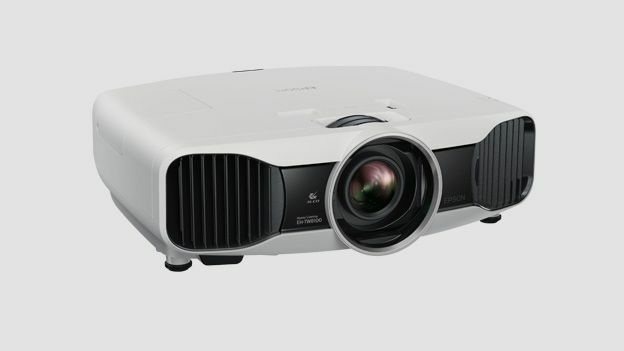 The projector offers manual focus and 2.1x zoom adjustment, along with a generous level of horizontal and vertical lens shift and keystone correction. Not only is the projector 3D ready, it'll also convert 2D sources (albeit with variable results). Epson now supports the Full HD 3D glasses initiative, which means that the model is compatible with a variety of third party RF glasses, although none are supplied in the box. Helpfully, the 3D sync emitter is built into the chassis, so there's no dongles to worry about. The EH-TW8100 is extremely bright at 2,400 lumens, and can comfortably be used in a room with ambient lighting. This makes it suitable for sports and games if you want to bust it out on a Saturday afternoon, as well as late night movie fare. Images are dynamic and detailed. While blacks could be more profound, there's nuance in the shadows and motion resolution is reasonably good. Colour fidelity is fine, with reds particularly ripe and bloody. You'll need a completely blacked out room to get a deep, contrasty image though. Epson rates contrast at an optimistic 320,000:1. The projector's 3D performance can be considered above average, as there's very little obvious crosstalk along with a good sense of depth. This classy 1080p LCD projector offers high-grade movie thrills at a relatively affordable price. It's a smart looking light cannon that's bright enough to be used in a partially lit room, great news for social gamers. It's also politely quiet in operation if you keep it in Eco mode, although when you engage 3D it does go into overdrive and become altogether more attention-grabbing. Stereoscopy is clean and immersive (active shutter RF 3D glasses extra). Overall, we rate this PJ a solid buy for big screen buffs.